Where’s the best place to build a helicopter landing site? What’s the best route for a tank? And where would a missile do the most damage? Geographic Technicians answer all these questions and more. Trained in hi-tech Geographic Information Systems (GIS), they analyse the landscape and give us vital data about it. Join us in this key role and you’ll learn to scan satellite pictures for enemy sites, make 3D models of the battlefield, plan special routes and more. Your training can take you far – within and outside the Army – plus, you’ll get to travel and do sports with mates. Then it’s off to the Royal School of Military Engineering in Minley for nine weeks. 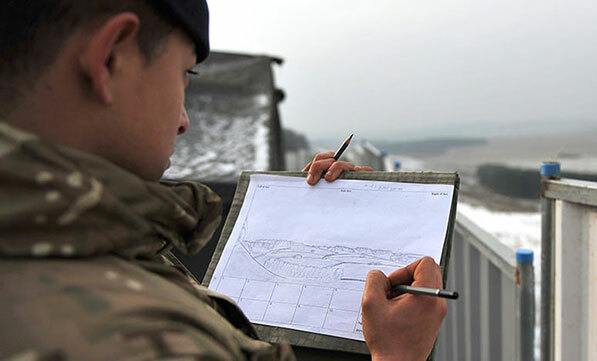 Here, you learn military engineering skills such as knots and lashings, demolition, mine warfare and bridge building. Next stop is the Defence School of Transport in Leconfield for your C+E (LGV) licence. Finally, you go to the Royal School of Military Survey in Hermitage. Over 42 weeks, you learn about GIS, geographic data, satellite imagery and terrain analysis. Your training will depend on your military experience, trade qualifications and the role of your unit. If you need basic soldiering skills, you learn them at your nearest Army Training Unit. Then, you go to the Army Training Centre, Pirbright, to be trained by Regular Army instructors. You learn to handle weapons, read maps and give first aid. Combat Engineer training is given by your unit. Finally, you spend two weeks at the Royal School of Military Survey in Hermitage learning the skills you need to be a Reserve Geographic Technician. You can also attend the Positional Survey course.